Celebrate St. Patrick's Day with Sandvox! Anyhow, we are still working behind the scenes to start getting those submissions published and we hope to accomplish that soon. (Big Thanks to everybody who has submitted their sites so far!) But with St. Patrick's Day around the corner, we couldn't help mention these two very timely Sandvox-built Websites submitted by William Murphy of Dublin City, Ireland. So we thought we'd highlight his websites here, in time for the big day. William has been a Sandvox user for a long time, since its early betas. His two latest Sandvox projects are St. Patrick's Festival and Streets of Dublin. He chose the green and orange variations (very appropriate colors!) of the Blueball Trifecta design for these two sites. 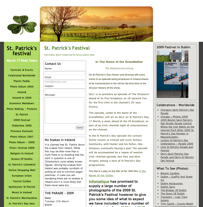 The website for St. Patrick's Festival is intended to capture the festival using high definition photographs, which are available to anyone who wishes to use them. Mr. Murphy reports that the 2008 version of this website (a part of the overall Streets of Dublin website) resulted in the sale of a number of photographs, including one that will appear in an in-flight magazine some time this month. Streets of Dublin is a larger website, the home base for a project that offers thirty thousand photos (hosted on the main website along with Flickr and Ipernity). So if you are looking for photographs of the city of Dublin then this is certainly the place to visit!